This review comes courtesy of Jon Lester, Staff Writer at Dealspwn.com: a leading UK games blog. In flight battles were the staple of this game. 1998 was an epic year for RPGs. Final Fantasy VII, Tactics Ogre, Parasite Eve and Xenogears all wowed us on the PSX… but for a few faithful Saturn owners, 1998 was all about something rather special. Released in an extremely limited run on a dying console, Panzer Dragoon Saga let us explore the beautiful and deadly Panzer Dragoon universe and remains one of the great cult classic RPGs of all time. The events of the game (and indeed the Panzer Dragoon series) take place in a bleak postapocalypic wasteland where humanity struggles for survival against genetically-engineered biological weapons that were created by a long-dead civilization. War never changes, however, and the remaining clans of humans continually fight each other over the spoils of the war that ravaged the planet in the first place. Players assume the role of Edge, a mercenary thrown into the middle of one of these disputes by his treacherous employers. Betrayed and left for dead, he unites with a powerful ancient weapon (the dragon, natch) and heads out to fulfill an ancient mission and learn the identity of a mysterious girl. Spread over 4 discs, Edge’s journey of discovery and vengeance is a truly impressive tale- but Panzer Dragoon Saga stands out from the crowd by introducing a unique battle system. Using a radical adaptation of the popular ‘active time battle’ mechanic, you’ll engage airborne opponents with a range of direct attacks, spells and buffs. However, since battles take place in free flight, you’ve got the choice between charging up attacks and circling around your enemy to target specific weak points. Identifying, maneuvering into range and pouring the hurt onto your foe’s Achilles heel is as important as dodging their counterattacks. The enormous flying foes and camera angles evoke the rail shooting heritage of its predecessors- essentially providing the best of both worlds. The game had action elements, but was more of an RPG with an engrossing storyline. 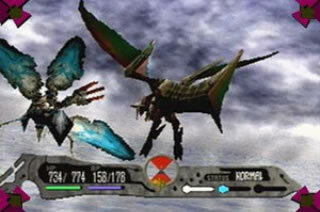 Traditional RPGs use multiple party members to fulfill different combat roles, but Panzer Dragoon Saga has to cope with a single (if incredibly powerful) character. Luckily, it has an ace up its sleeve. The dragon can be dynamically evolved into any combination of power, defense, speed or combat magic by sliding a pointer around a chart… and as the dragon’s stats change, its body visually alters to reflect your choices. The dragon can be evolved at any time or even in the middle of a fight, allowing for a range of combat tactics that belie its lone protagonist. 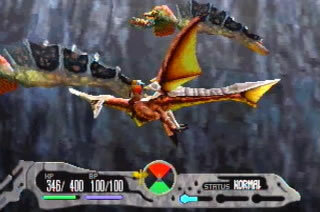 Panzer Dragoon Saga is now a collector’s item that frequently attracts three-digit prices when sold at auction. Considering that there’s almost no hope of a next-gen remake or downloadable release, it’s likely to be expensive and extremely difficult to lay hands on. The diehard, however, will find a hidden gem that fully justifies its near-mystical status… and revere the last remaining physical copies as things of utter beauty. I know I do. An out and out amazing game. I managed to pick it up for £40 6 months ago after years tracking bargains on ebay, sweet review.